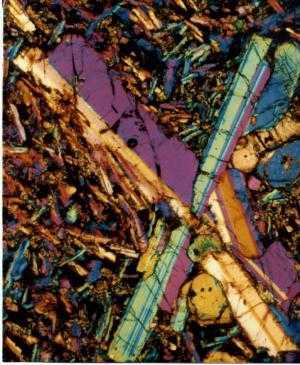 Have you ever wondered what the basement rocks of the Beibuwan or Gulf of Tonkin (located off-shore north of Hainan Island in south-western People’s Republic of China) look like under a microscope? Images: crossed-polarised light with ¼ lambda plate ×160 magnification. 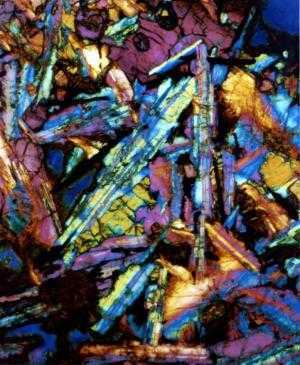 They are beautiful contact-metamorphic rocks or “Hornfels”. 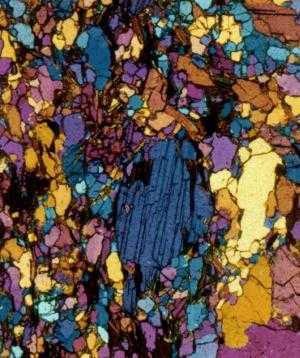 This rock type is usually found in contact aureoles bordering igneous intrusions. These granitic intrusions are accompanied by copious chemically-active liquids and gases, which cause hydrothermal contact metamorphism of the surrounding country rocks. The age of these rocks, by potassium/argon age-dating method, was 91.7 ± 4 million years before present, or Cretaceous. How much did it cost to obtain a sample? In excess of US $5 million to drill to 3,459 metres (55 days) to obtain this basement core. After the microscopic analysis, what did I do with the core? Oh, no! I wanted a souvenir of this very expensive unique rock. So now, my wife wears a highly-expensive, polished, piece of hornfels jewellery as a necklace. However, at parties, it is always a beautiful topic of conversation of high interest to all.